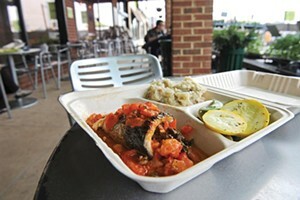 Ellwood Thompson's uses compostable carry-out containers. Sprout Market & Café is a rare local bar that recycles; its Green Duck containers for takeout are biodegradable. Secco Wine Bar, Mezzanine, the Empress, Savor, GlobeHopper Coffee, Acacia Mid-Town, Boom Boom Burgers and Wyndham Virginia Crossings also use Green Duck containers and recycle. Most also buy local products from earth-friendly artisan growers who don’t have far to drive. Ellwood Thompson’s Local Market sets the eco-dining standard, with compostable or recycled aluminum carry-out containers, rain barrels out front, a white-painted roof, composting to make liquid fertilizer, recycling, light-emitting diode illumination, local foods and other efforts. Customers who bike, walk, skateboard or arrive by bus get 25-cent “enviro-credits” while they make Richmond a shade greener.